Graduation season is around the corner for the Class of 2018 at high schools and colleges across the country. For schools that host their graduation ceremonies in their gymnasiums or stadiums, a ScoreVision jumbotron display provides the perfect opportunity to make an important occasion even more monumental for graduating students and their families. ScoreVision’s versatile production capabilities make it easy to put on a professional event for students and parents. Cast a live camera feed onto the display, surrounded by your school’s colors, mascot, or crest. 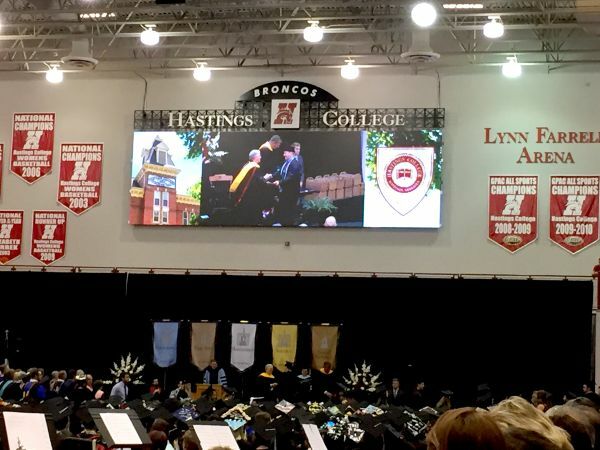 Take a look at how Hastings College incorporates their ScoreVision jumbotron display into their graduation ceremony. With the ScoreVision Producer App, creating this professional experience is accomplished with just a few steps and minimal equipment - no need to have a large production team running around behind the scenes. ScoreVision customers can contact our support team for more information on utilizing this functionality in upcoming graduation ceremonies. Stay tuned for other ways to use ScoreVision jumbotron displays outside of athletics. Follow us on Twitter, Facebook, and our e-newsletter to be the first to know when it’s released.